Will you join me today for a trip to France? 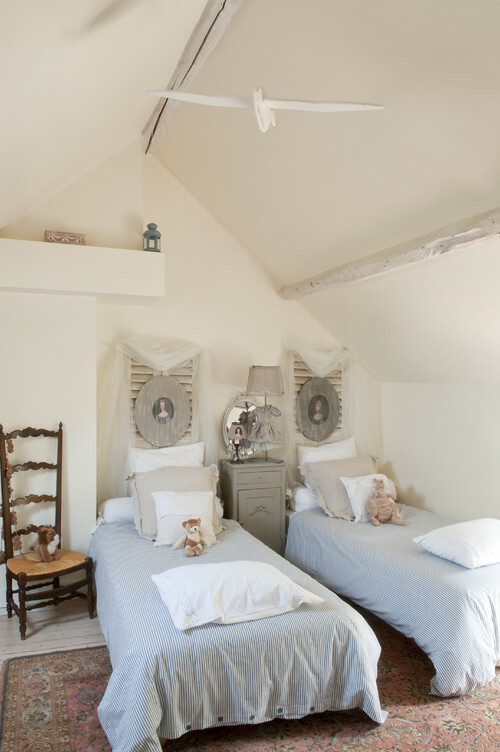 We’re touring a beautiful French Country Cottage decorated by Catherine Sandin. I think you’ll fall in love with its Old World charm and romance. The quaint farmhouse exterior makes you feel you’ve stepped back in time to another era and place. Step inside and you’ll find wonderful French country details. Soft neutrals and textures pair with architectural elements throughout the home. 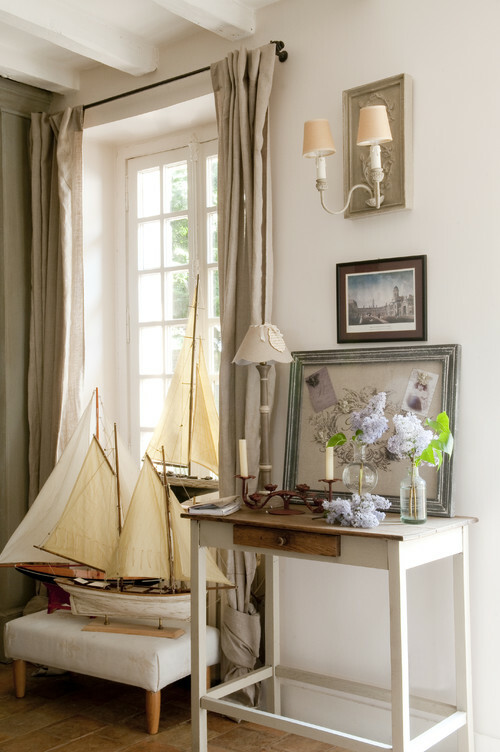 Beautiful linen drapes frame a mullioned window decorated with small sailboats. Fresh-picked lilacs lend an air of femininity. French country details populate painted shelves. You’ll find many of these elements in American homes today. 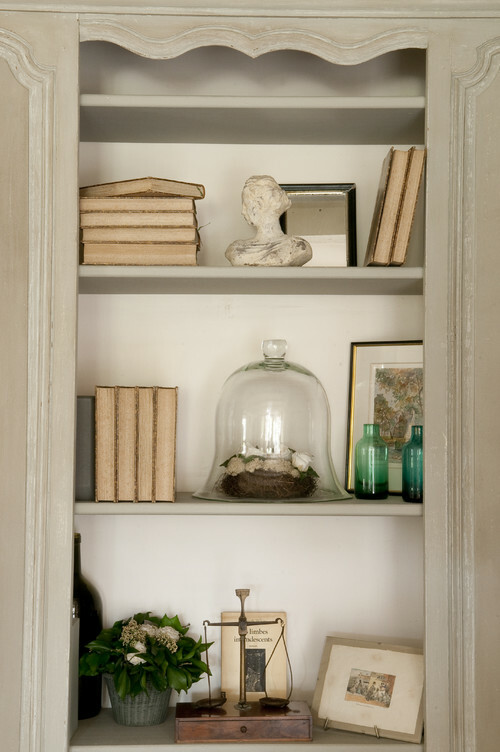 A cloche with natural elements, books facing backwards, a small plaster bust, colored glass bottles, and a vintage scale. A view into the dining room reveals Old World architecture found throughout the French country cottage. White painted furniture and a worn rug soften a tile floor while a small chandelier adds a bit of bling. 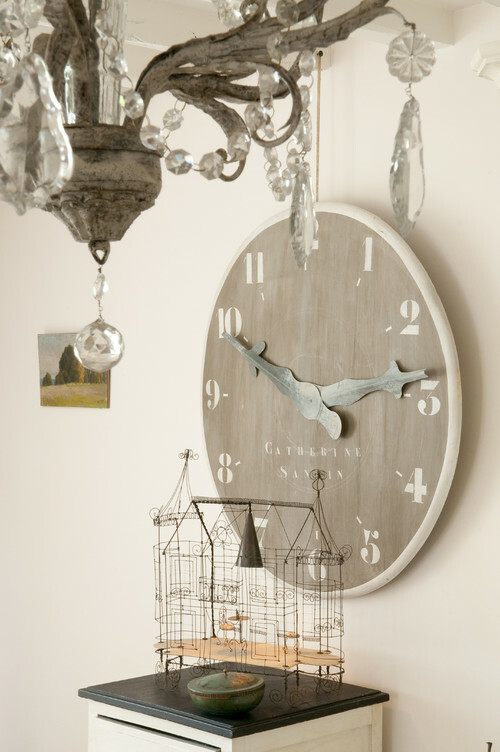 My eye was drawn to the over-sized clock with a whimsical wire bird cage below. 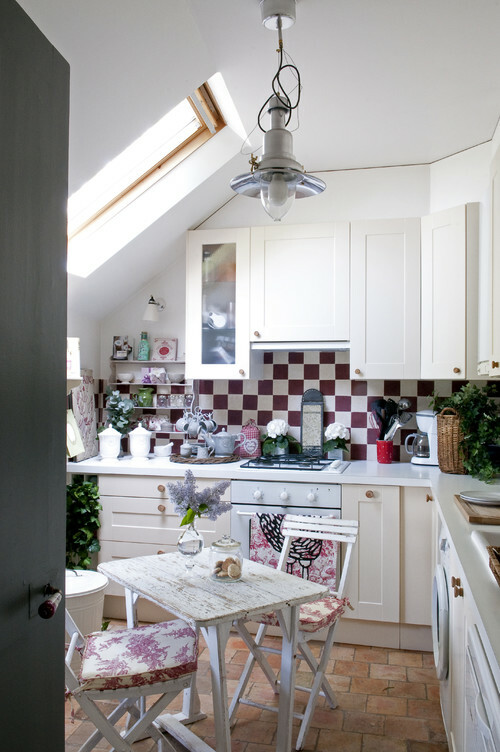 Red and white tile join painted cabinets in the cozy French kitchen. A pretty red toile fabric graces the cafe chairs. 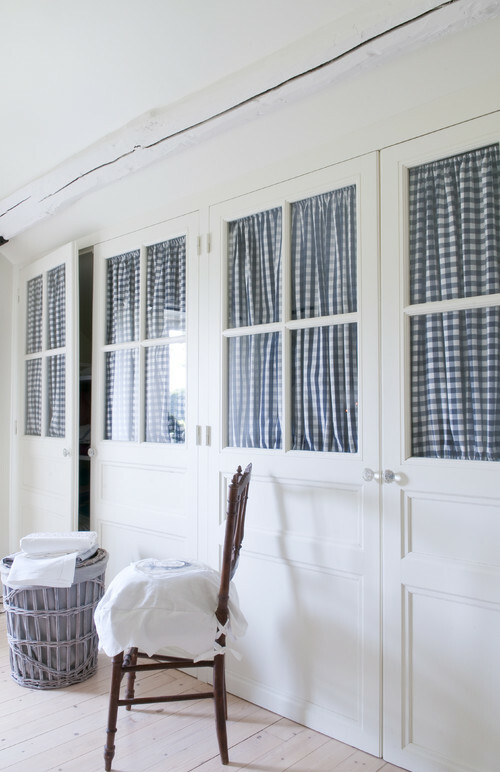 Farm doors with blue and white gingham fabric at the windows line one wall of the laundry room. Wouldn’t it be fabulous to have this much storage space in the laundry room? Duvets in blue and white ticking cover twin beds in a girl’s bedroom. Vaulted ceilings throughout the home create a feeling of spaciousness. 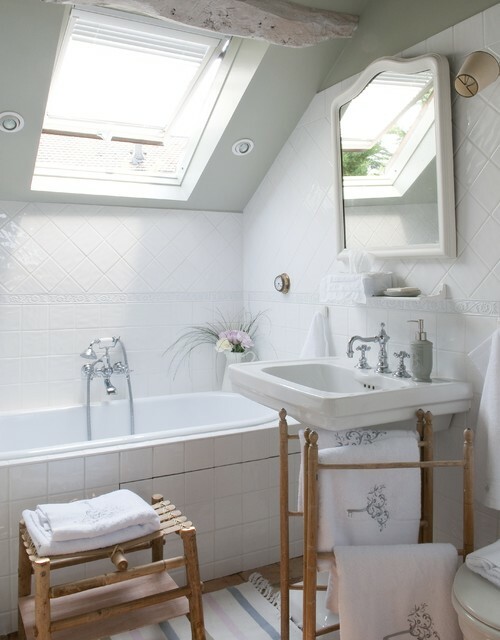 A skylight over the bathtub gives the feeling of bathing under the stars in the evening. Gorgeous wisteria and arching vines adorn the outdoor patio area. 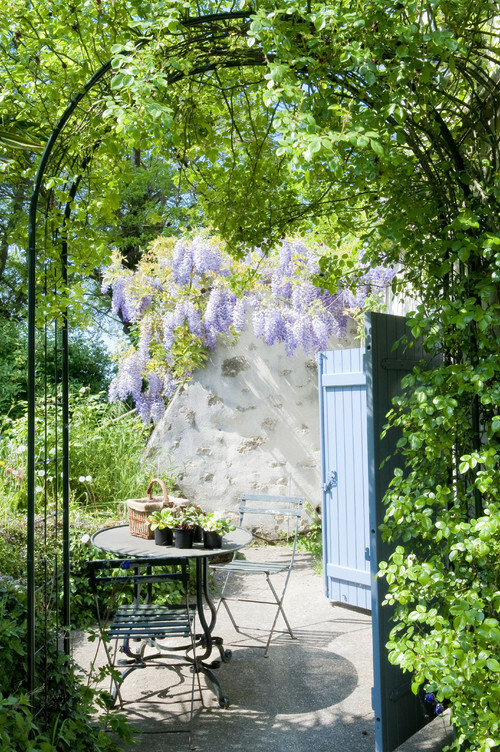 Love the pair of blue farm doors that open up to this lovely, romantic terrace. I hope you enjoyed a little bit of France while touring today’s French Country Cottage. Rustic yet elegant. Some very nice decorating ideas and furnishings. I love that Wisteria in the courtyard. How lovely. Beautiful way to start the day! Thanks! I want to move. Thank you for letting me experience this beautiful cottage. Thanks so much for the tour. 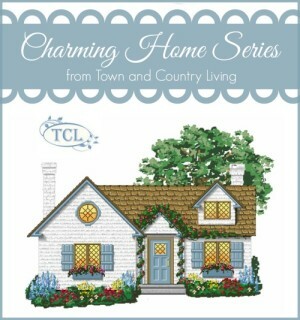 French country is my favorite decorating style. Although I think I would need a bit more color than this. Beautiful home. I enjoyed this tour it was wonderful. 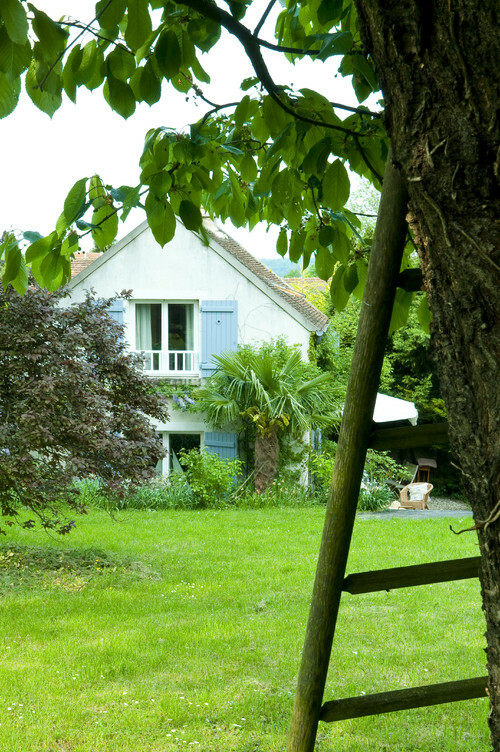 The French certainly know how to make a home lovely yet cozy. Thanks. What a sweet cottage. Love that kitchen. This is such a sweet cottage. Love the floor tiles and the kitchen. So inviting.